How many times have you heard a group of people discussing recipes and each one thinks that the way he or she makes it is the correct way and the rest are wrong? I have heard this conversation umpteen of times and eventually it turns into an argument. This ingredient is not suitable with so and so, that ingredient is a no no in that recipe, etc etc. The truth is that each of us cook to suit our needs, we consider the tastes of each and every member of the family, their likes and dislikes and then accordingly prepare the dish. We come across a lot of recipes these days and the most sensible thing to do is get an idea of the ingredients and method and then add or subtract the ingredients according to your taste. This may not be true as far as certain ingredients may be concerned, e.g. you cannot bake without a baking agent if the recipe demands or do without salt, if you want all the other flavours to come out to its fullest. So when I decided to make guacamole salad I adapted it to the way hubby and I would like it. Sometimes children may not like the idea of raw onions in a salad, but you still want the flavour. The answer is simple, just mince it. The same goes with garlic, chillis, ginger etc. 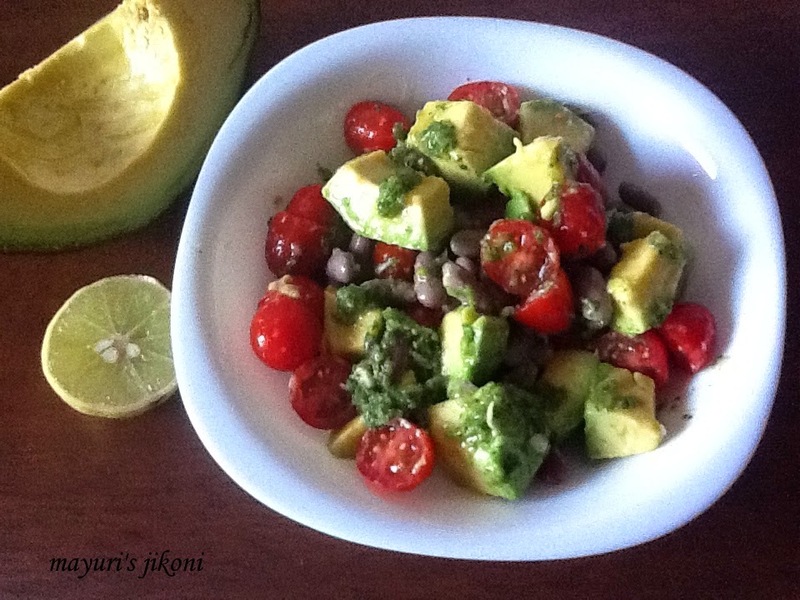 Abundance of avocados, fresh kidney beans and lovely plum tomatoes. Putting these ingredients together resulted in a yummy delicious, filling salad. An ideal light dinner or lunch solution. I served the salad with some nachos but forgot to take a picture 🙁 The fresh beans do not appear as red as the dry ones or canned ones but they are more delicious and easy on the stomach. Cut the avocado into chunks after peeling it. Add about 1 tbsp of lime juice to it to prevent it from turning dark. Add beans and tomatoes to the avocado and mix gently. Mince coriander and garlic coarsely in a chopper. Add lime juice, minced onion, salt, chilli, oil and salt and mix well. Serve immediately with nachos or chill it for 30 minutes in the fridge before serving. Add cooked sweet corn if you like. Instead of green chilli can add chopped jalapeno. If you like, chop a medium onion and add to to the salad. Don’t put onion in the dressing. If you don’t get any cherry, plum or grape tomatoes use normal tomatoes. Just cut them into chunks. Healthy salad. Thanks for linking.